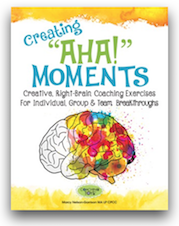 a life coach, workshop presenter or manager who believes in the power of your clients’ creativity? looking to invite those around you into a deeper awareness of the unique and personal gift that they are? Each inspiration card is a sturdy, glossy, 4x6 inch gift. On the back of each card are 14-20 questions that you would experience in powerful, transformative coaching. Inspired by the collage, these questions are guaranteed to motivate out-of-the-box thinking, magical imagining, and deep connection with the creative spirit that is each person’s deepest, truest self. Click HERE to see each card and the questions behind it. Then select the card deck for you from the drop down. Single-card decks are perfect for workshops or teams and contain 35 cards. The Variety Pack contains 30 unique cards. Allow the collage to inspire you - what images come to your being? Each set comes with an “Ideas for Use” card.